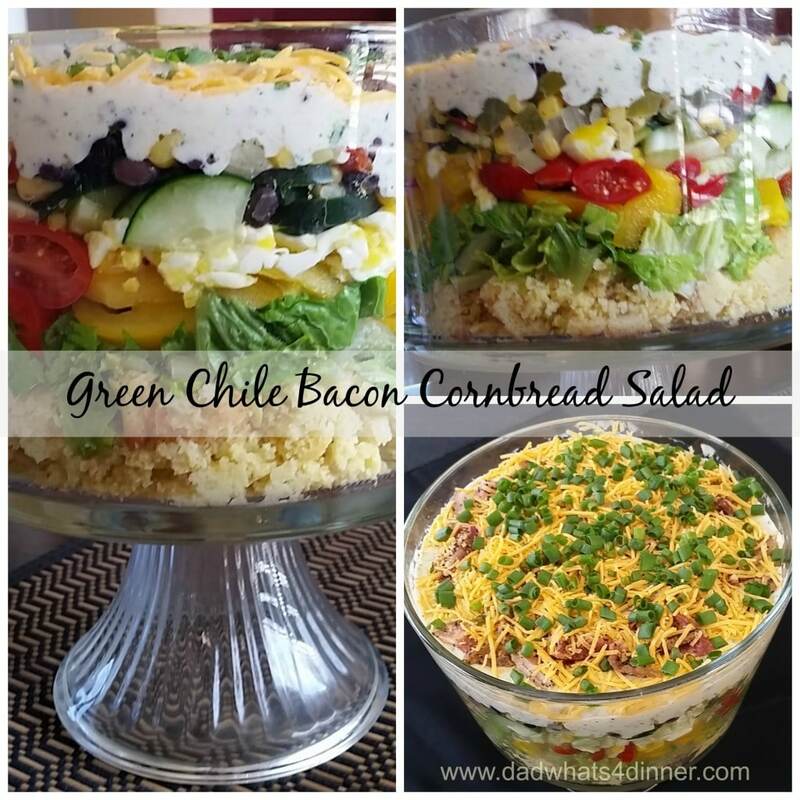 My Cornbread Salad is a loaded layered salad made with my awesome Green Chile Bacon Cornbread. Easter is behind us and Spring is in full swing. The kids are on spring break and are already telling me how bored they are. When my kids go back to school next week they will only have 32 days of school left for the year. Where did the time go? Soon it will be Mother’s Day, then Memorial Day then before you know it it will be July 4th. Wow, how the time flies. 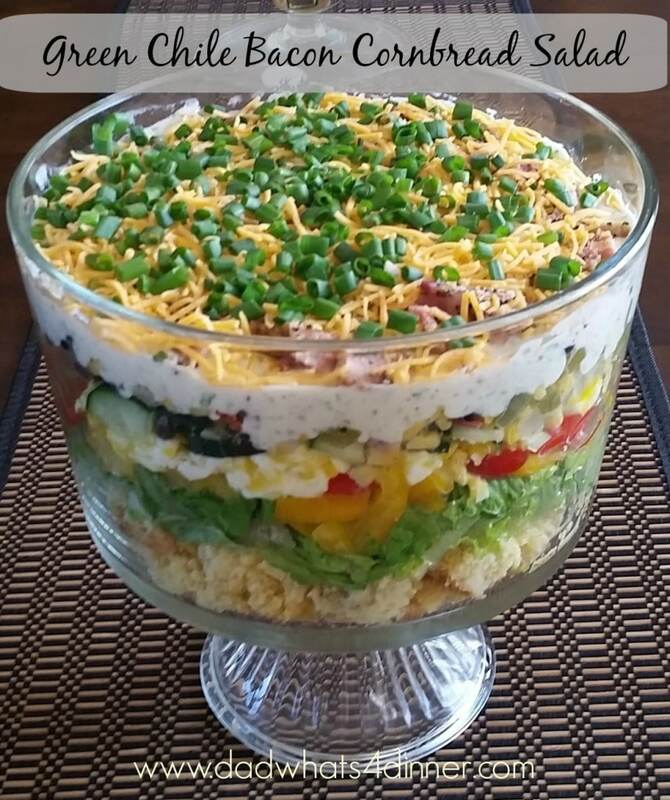 So as you are starting to plan your menus for Mothers Day and summer cookouts make sure you add this Green Chili Cornbread Salad to the mix. My Cornbread Salad recipe is a great easy dish to bring to your next cookout or potluck. 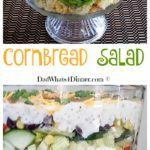 It is amazing how well the cornbread mixes in with this layered salad. People might look at you funny when you tell them the name but not after tasting it. Add jalapeno if you would like it a little more spicy. Cook the cornbread and prep all other ingredients a day ahead. In the morning of your gathering, build the salad and place in refrigerator for several hours to allow flavors to develop. Bake cornbread as directed below. Allow to cool completely before using in salad. In small bowl, combine ranch dressing mix, buttermilk and mayo, blend well and refrigerate until ready for salad assembly. 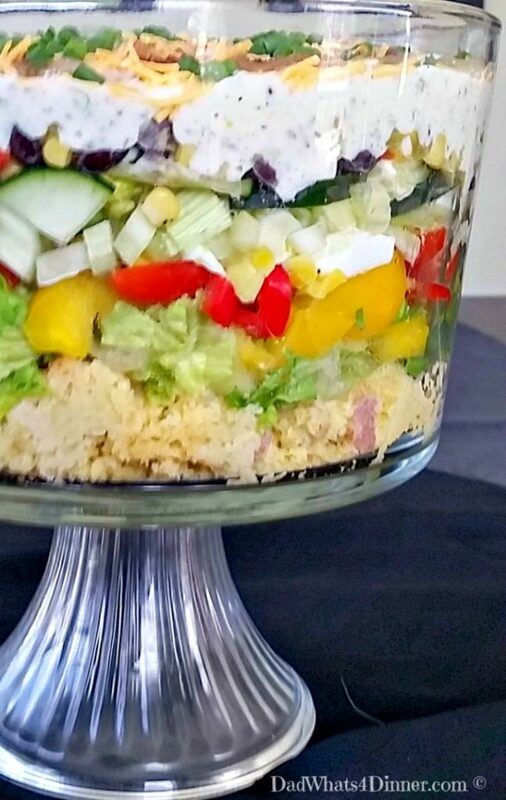 For salad, place cornbread cubes in bottom of trifle bowl or other glass bowl. Layer on lettuce and next six ingredients. Pour dressing over the top and spread evenly. Top with cheese, bacon and green onion. Grease 9 x 13 baking dish with 1 tablespoon reserved bacon grease. In a large bowl combine cornmeal, flour, salt, baking soda and baking powder. In a mixing bowl, beat butter and sugar. Mix in eggs and sour cream to butter/sugar mixture. With mixer speed on low, add the milk and dry ingredients, a 1/3 at a time, alternating between wet and dry. Do not over mix. Slowly add in green chiles, cheese and 1/2 cup chopped reserved bacon. Bake for 25 - 30 minutes until browned and a tooth pick inserted comes out clean. 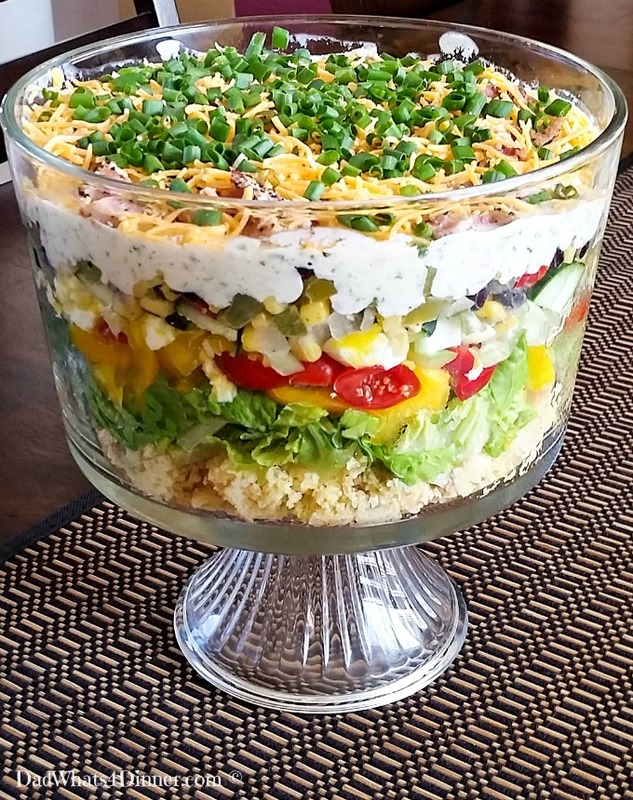 Great salad for potlucks or cookouts. 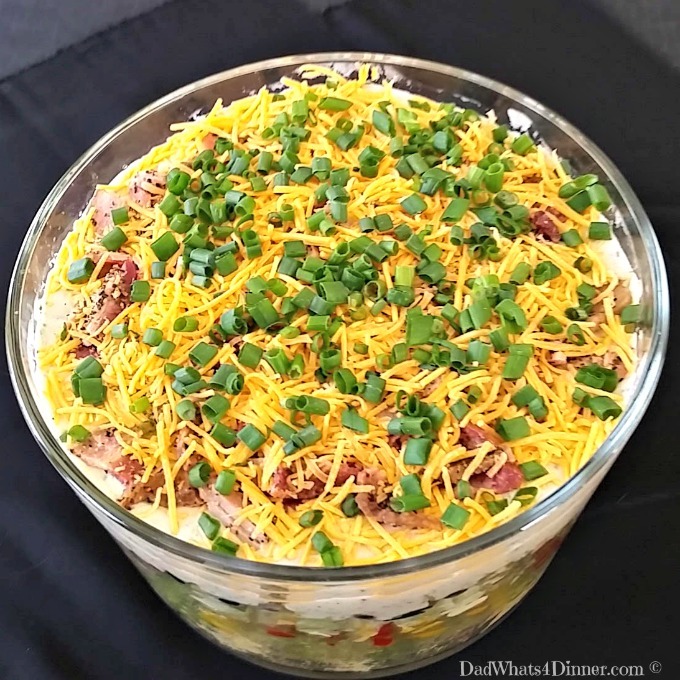 I also will be bringing my Cornbread Salad recipe to Freedom Fridays, Friday Favorites, Fiesta Friday, Weekend Potluck, What’s Cooking Wednesdays. Check out my Link Parties Page for other great places to find new recipes. Thanks IT is very easy and taste great after sitting a few hours. Starting to like picmonkey.com for the pictures. I figured out a few more things out. Thanks. The cornbread really adds a nice change in texture and flavor. Any cornbread will do, I just like adding more flavor. And yes King Arthur is great. Have a great weekend. Happ FF! Thanks. It is very good.. The cornbread adds great texturw and flavor to the dish. Do you use coconut flour often? I made a sponge cake earlier this week using 1/2 coconut flour and 1/2 corn flour (starch) Both Gluten-free. The flavor was good but the cake fell. Might have been because I dropped it when I tried to remove it from the pan. OOPS. Made again just using corn flour. Did not fall but I was also very careful. Have you had good luck with coconut flour? Happy FF! OOPS! (I’ve made way bigger mistakes int eh kitchen though.) So we actually have a coconut allergy in my family, which is really inconvenient combination with my milk allergy. Nonetheless, I haven’t experimented too much with coconut flour. I always find flour mixtures to work the best flavor (and usually standing up wise), but I believe coconut flour is pretty dense, so that may be part of it. We try (try being the key word) to weight our flours, rather than substituting it at a cup to cup ratio. So if the corn flour stood up, maybe see how much weight that took, and then for however much you take out substitute in that weight of coconut flour? Just an idea, I have no idea how it’ll work. Here’s some tips I found that may help (but I don’t have much experience in the coconut flour department): http://thingsmybellylikes.com/2013/03/21/baking-with-coconut-flour-10-tips/. Ouch double whammy!!! Yes I am at the point in my baking where I try to go by weight instead of volume. Seems to give a more consistent product. Thanks for the link. This salad looks and sounds delicious. I love a good salad. None of that wimpy stuff for me. Great summation of Memorial Day! I also love picmonkey! 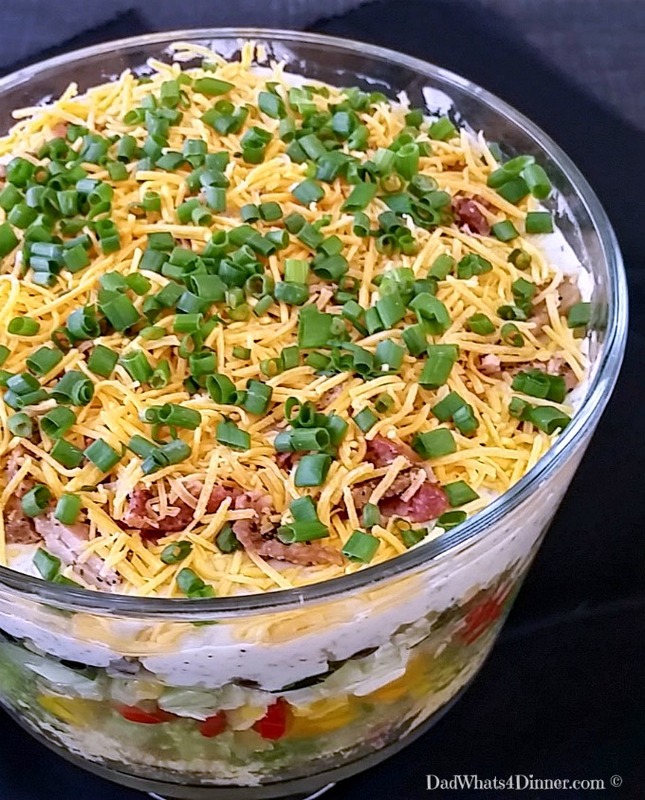 I’ve never had a cornbread salad, but I think I need to try this one! This salad looks perfect for summer! 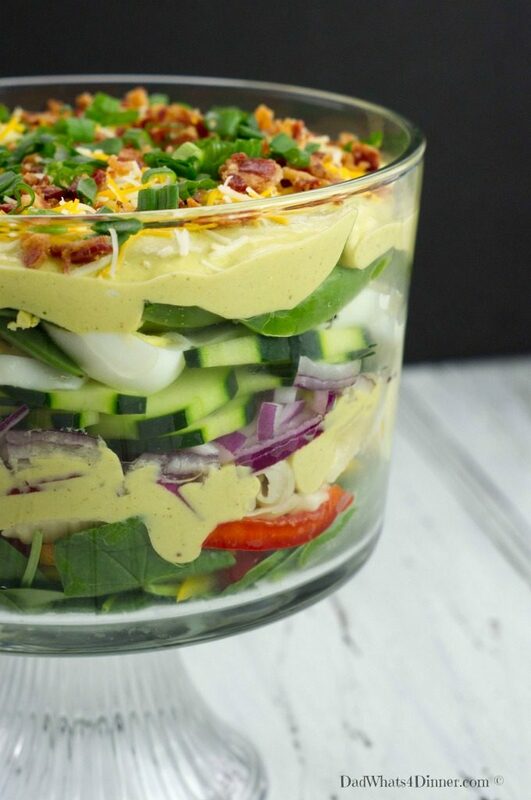 I’ve only ever had a traditional 7 Layer Salad, but this looks like it would knock that out of the park! Thanks so much for joining us at Freedom Fridays – I’ve pinned and scheduled a FB share! Have a great holiday weekend! Your FB share took my views through the roof today. I really appreciate it. If you have any advice on how to increase my FB traffic please send me a message or email. Did you also share my Mini Strawberry Pies on your FB page? One dad’s recipe. Thanks Quinn. My sister in law makes cornbread without egg. I’d like it better than mine. Congratulations on getting this recipe featured on Fiesta Friday! Thanks Julie. Pretty pumped about it. Have a great weekend. This is a lovely salad. I mentioned it as salsa when I commented on FF. It was due to the amazement that I mixed up the names. This is so cheerful and whenever I see all these colours together I go crazy! I am not a salad person but I forgot it and am ready to dig into that bowl for some pure bliss! Congrats Quinn on having this as an Fiesta Friday feature! I think that cornbread alone sounds outstanding! My sister introduced me to cornbread salad (she has lived in the South) and although it sounded odd to my Minnesota ears, it is fantastic! Yours looks even better with the southwestern twist! Love the cornbreD addition. This salad would be the biggest hit on any summer buffet table. Just so inviting and full of favorite layers of flavor! The cornbread adds a nice texture and floor to an already wonderful salad. Thanks for stopping by and leaving your nice comments. I want to get one of these salad bowls…. makes the food that much more fun to look at over a big Sunday dinner. This just looks like layers upon layers of fabulous flavor! I can’t believe how many great things have come together in this salad. It’s perfect for game day! Can’t wait to give it a try! Hi Kathryn. Yes this is a perfect salad for game day or Thanksgiving dinner. Thanks for stopping by. Wow! Impressive . . .most impressive! Really looks delicious! Pinning and tweeting to share! Thank you for sharing your recipes with us at Snickerdoodle Sunday! This salad looks divine! Thanks for sharing with us at Funtastic Friday. Hope you join us again this week. Dang…this looks awfully good!! Thank you so much for being a part of Snickerdoodle Sunday- hope you’ll return for more fun tomorrow! I want some of this please. Maybe a whole bunch! Hey Quinn, this salad looks fabulous! I love a layered salad. Pinning! Do you combine it all together before you serve or just dig in through the layers? By the way, I’m so ready for school to be out! Thank you for sharing at Funtastic Friday! Hope to see you tonight! Yum!!! This sounds perfect for summer cookouts. 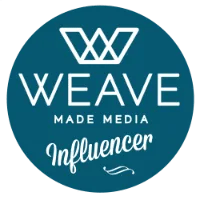 Already pinned & will share on my FB page. Thanks for linking up with Merry Monday this week.